We're thrilled to announce that one of our clients, the Dark Mod Team at Broken Glass Studios, recently launched the standalone version of their wildly popular open source game, the Dark Mod! Here's is a testimonial from the Dark Mod Team about how New Media Rights helped them launch their game. 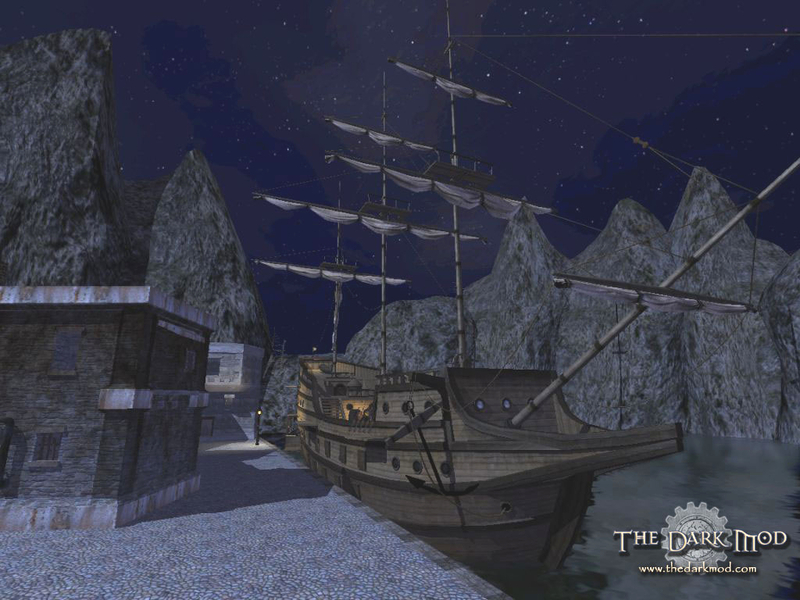 The Dark Mod is a completely open source, free to download and play game created by hundreds of dedicated volunteers all over the world, and bills itself as "Stealth Gaming in a Gothic Steampunk World." It's an example of the best kind of collaborative creativity the internet enables, bringing to together, artists, designers, and programmers from across the planet to create something for the public. Here's their story and how New Media Rights helped them. "The Dark Mod Team (aka Broken Glass Studios, www.thedarkmod.com) recently released a standalone version of our game, The Dark Mod, which until that point had been a mod of Doom 3 (meaning one had to own Doom3 first in order to play it). In short, people could just download our game and play it ("standalone"), even if they didn't own Doom 3. The process of going standalone required us to replace all the assets our game used that were owned by Doom 3 (and there were a lot!) with new, free assets -- i.e., ones we could freely release publicly -- that had to be both different & do the same job as the old Doom3 assets (in the sense that our maps would depict the new assets in place of the old assets, so they had to still fit). The practical problem this presented to our artists was what led us to seek help from New Media Rights. To our great fortune, New Media Rights went into great detail over all the issues we needed to think about in our process of going standalone, much beyond what we were expecting. It was important because the task was so huge (we're talking about 100s of assets), and there were so many potential landmines at every turn, that having a guide through the potential IP & legal issues was very important. I'm not sure we would have been able to sustain the motivation over the long haul without a little certainty in what we needed to do to make our standalone the right way and feel some confidence that our work would not be wasted. So in that respect, NMR's assistance was exactly what we needed. Also simply in practical terms, our artists needed NMR's guidance to even know how to go about creating specific assets, like what features or aspects could be kept or needed to be changed, and in what respects. So NMR's assistance was incredibly helpful in both big and little ways. How did you find out about New Media Rights? The arists in our team opened a thread in our forum to specifically discuss the IP issues of making new assets in going standalone, and many of them looked to me as I'm our resident lawyer that's actually taken a copyright course. But the issues quickly went over my head. So on my own initiative I did an online search. I found that NMR pages were popping up again and again with practical information on exactly the sorts of issues we were having, issues that other potential sources weren't talking about at all. But I found our very specific question wasn't quite covered. So I emailed NMR asking them to clarify some issues for our specific needs. It was then that Art Neill from NMR contacted me directly and we set up a much more involved relationship, since it was clear our kinds of questions couldn't be answered over a simple email or phonecall. I was very happy to see how much NMR was able to get involved in following up on our questions and doing such extensive research, and then explaining it carefully and answering questions, to cover all the kinds of bases our problems were touching. How did you feel about having this problem? or What were your concerns before NMR assisted you? Our main concern was that there wasn't a simple answer for how to deal with creating assets for our game to go standalone. Of course our intention has always been to be completely legal and never use anything protected, and we were quite willing to do as much work as it would take to do that. (And in fact it took more than a year and a half of work create 100s of assets to do just that!) We want our game to be above scrutiny so no one would ever have any reason to restrict it. But the issue we had was that we needed assets that had to fulfill the functional elements of our game without treading on others proprietary righs, which was a subtle task. Even wanting to do the right thing, we needed guidance on how to do it! How did New Media Rights help you with your problem? and things to look out for. NMR also helped with the other kinds of assets we had, such as non-engine code and sound files. replacing 100s of assets without giving them some confidence in advance that all that work won't be wasted (or worse, get us into real trouble or shut down our game! ), especially when they don't know what work they're even supposed to be doing, or what standards they should be following in doing the work. By giving us some guidance to work with, NMR did a world of good in just giving us the confidence that this is a project we could do. Even when their advice might ostensibly require *more* work from us, it was better in the long run in giving us some certainty in what our task was before us. For example, there might have been a temptation to take risky shortcuts without NMR's assistance, and it might have been hard to convince some artists we really needed to do 100s of hours of more work to do this right. But with the greater certainty NMR gave us about what our task involved, we could put together a plan and build the motivation and actually put in the hard work to do what we needed to to release our standalone game in a proper way. It was a huge task, and now we've done it! How has NMR helped improve your life? Well our entire team is on a tremendous high for having finally released a standalone version of our game. Our download numbers within the first few days indicate something in the neighborhood of 50,000 (it's hard to count since there are many download sources; but some individual sources alone are well over 10K), and there are indications that it's still rising from that. We have received significant media exposure, almost universally positive. Our game had already received great reviews and even a "Mod of the Year" Editor's Choice award when it was a mod, but now that it is totally open for anyone in the public to play, it's getting a lot more of the recognition it's always deserved. It's very gratifying to have this kind of response after all our hard work. NMR is one of the resources we needed to make this happen, and without them it may not have happened at all, or it would have been a much riskier & scarier prospect.And we have not had any questions raised about our assets. I think all of that speaks for itself. Why would you suggest other people check out New Media Right and ask for assistance from us? The main reason I'd suggest NMR to others is that NMR goes way beyond a simple Q&A brand of help with IP or legal questions. In our case, they went into significantly more detail in gathering all the information and aspects of our specific issues, doing hard research on all the legal issues potentially raised, and then packaging it all into a weighty brief that not only answered our most pressing questions, but also was written in a practical way we could actually use as working developers. NMR is in the business of assisting digital artists in getting their creations to the world in the right way. There are so many complex issues out there, that by itself the simple desire to do things legally and properly isn't enough. We need guidance. And as my original searches confirmed, I couldn't find any other group that was even looking at the questions we needed answered except NMR, to say nothing of a group willing to offer free assistance in meeting our goals, to say nothing of going to the great lengths NMR went to do it. NMR did all of these things. I cannot say enough positive things about how helpful NMR has been to us and would be to any artist in the digital era. I wholeheartedly recommend them to anyone hoping to venture artistically into the new media. It's dangerous to go alone! Take NMR! This testimonial does not constitute a guarantee,warranty, or prediction regarding the outcome of your legal matter.